Welcome to Hong Kong Stories' Monthly Live Show! 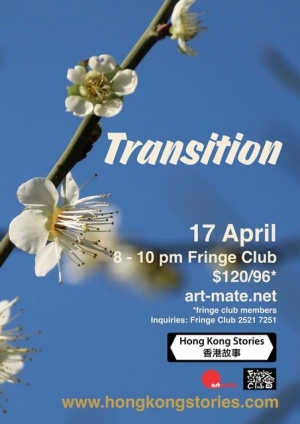 Take your seats and enjoy an evening of entertaining true stories told live, under the theme “Transition”. As we move from winter to summer in Hong Kong, enjoy a wide variety of personal stories where our storytellers tell you about the springtime (or autumn) of their lives. The stories will be about people, places, things or phases of transition, literally or figuratively. Our storytellers work on their stories in advance and deliver them on stage without notes, creating a unique and heart-warming human experience. Hong Kong Stories is a not for profit society dedicated to the art of storytelling. It’s better than drama, it’s better than comedy, it’s real life.